The War for the Figs — Who Will Win? I had gone outside and started tying the first of fifty or so shiny gold ribbons on the fig tree when a mockingbird landed on the nearby split-rail fence and started, well, mocking me, as though I were a fool who credited him with less than a birdbrain. I tried to scare him off by duplicating the sound of a shotgun blast, but that came out as a soft pop of air and failed to ruffle even one feather. He continued to taunt me. I paid him no mind as I moved from one branch to another cutting and tying on streamers. It wasn’t until a blue jay settled into a high bough, cursing, that the idea came to me to curl the ribbons so they might dangle and dance on a breezy day or appear as snakes on a calm one. Sadly, neither of these threatens a blue jay which loves bright shiny objects. Already she was probably planning to feather her next nest with them, a nest that would be built long after she and her family and friends had eaten the figs and the leaves had fallen and been raked. I am willing to share, but I have my limits. Several years before an arborist came to prune the tree, three herding dogs barking from the windows of the man cave and long silver streamers twirling under the leaves discouraged wild life from eating the fruit hanging from the lower branches. This year I had not even gone through a spool of gold before a squirrel leaped from the roof of the house onto a branch opposite the blue jay. That is when I understood two things –these animals, which were not made to mix, no longer feared the barks that came from within our home, and they had formed an alliance to shoo me from this goddess of all fig trees. Just last year my 89-year-old Gene had made a short video in his backyard of a fox and raccoon eating leftover spaghetti from the same bowl. It was a scene from the peaceable kingdom. No one made a fuss. Especially not Gene, who prefers the food prepared by The Golden Corral to his own. But I can’t say there will any quiet here for the next three weeks. Maybe if I channeled my Native American ancestors, I would waive ownership of the tree and give into these greedy critters, which will soon be drunk from the sugar fermenting in their tiny brains. 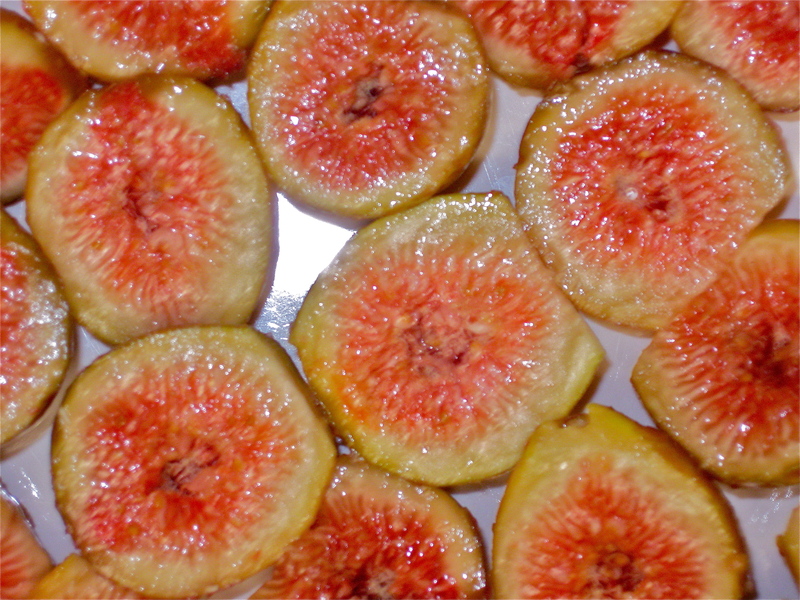 But since I, too, have a passion for figs — plain, broiled with prosciutto and cheese or preserved. I won’t. It’s time to let the dogs out. This entry was posted in Domesticity, Humor, Uncategorized, Writing and tagged birds, blue Jays, figs, gardening, harvest, herding dogs, mockingbirds, squirrels, trees, war, wildlife on August 6, 2013 by Terry Perrel.